In The Adventures of Tom Sawyer and Huckleberry Finn, Mark Twain introduced two of the most iconic boys in American literature. Tom and Huck become heroic figures, despite their penchant for bad behaviour. Indeed, it is their propensity to be impulsive, break rules and defy authority that win them the day. Today, however, Tom Sawyer and Huck Finn have become the posterboys for a psychiatric disorder, Attention Deficit Hyperactivity Disorder, or ADHD. I trace how and why attitudes about pathological boys’ behaviour reversed during the twentieth century, from a focus on shy, introverted, and physically passive boys to the very opposite – boys like Tom and Huck. I argue that, rather than imposing limits on childhood behaviour, we should be more accepting and encouraging of all types of children. Dans Les Aventures de Tom Sawyer et Huckleberry Finn, Mark Twain a fait connaître deux des garçons les plus emblématiques de la littérature américaine. Tom et Huck deviennent des personnages héroïques en dépit de leur mauvaise conduite. En fait, c’est leur tendance impulsive ; leur inclination à enfreindre les règles et à défier l’autorité qui les aide à sauver la mise. Aujourd’hui, cependant, Tom Sawyer et Huck Finn sont devenus synonymes d’un trouble psychiatrique, le trouble du déficit de l’attention avec ou sans hyperactivité, ou TDAH. Cet article retrace en quoi et pourquoi le 20e siècle entraîne un revirement des attitudes vis-à-vis des troubles pathologiques du comportement chez les garçons ; l’accent n’est plus mis sur les garçons timides, introvertis et physiquement passifs mais sur des garçons comme Tom et Huck. Cet article conclura en soulignant que, plutôt que d’imposer des limites au comportement des enfants, nous devrions avoir une attitude plus ouverte et encourageante envers tous les enfants quelle que soir le nature. In Mind Fixers, Anne Harrington, author of The Cure Within, explores psychiatry’s repeatedly frustrated struggle to understand mental disorder in biomedical terms. She shows how the stalling of early twentieth century efforts in this direction allowed Freudians and social scientists to insist, with some justification, that they had better ways of analyzing and fixing minds. But when the Freudians overreached, they drove psychiatry into a state of crisis that a new “biological revolution” was meant to alleviate. Harrington shows how little that biological revolution had to do with breakthroughs in science, and why the field has fallen into a state of crisis in our own time. Mind Fixers makes clear that psychiatry’s waxing and waning biological enthusiasms have been shaped not just by developments in the clinic and lab, but also by a surprising range of social factors, including immigration, warfare, grassroots activism, and assumptions about race and gender. Government programs designed to empty the state mental hospitals, acrid rivalries between different factions in the field, industry profit mongering, consumerism, and an uncritical media have all contributed to the story as well. In focusing particularly on the search for the biological roots of schizophrenia, depression, and bipolar disorder, Harrington underscores the high human stakes for the millions of people who have sought medical answers for their mental suffering. This is not just a story about doctors and scientists, but about countless ordinary people and their loved ones. A clear-eyed, evenhanded, and yet passionate tour de force, Mind Fixers recounts the past and present struggle to make mental illness a biological problem in order to lay the groundwork for creating a better future, both for those who suffer and for those whose job it is to care for them. A recent review of the book in the Atlantic can be found here. “Mechanical objectivity,” which Lorraine Daston and Peter Galison trace to the mid-nineteenth century, often coincided with efforts to inscribe nature “directly,” such as through automatic registering machines. But what did this inscription entail? Addressing this question requires that we reexamine indexicalization: the shift in semiotic ideology whereby medial technologies are imagined and acted on as if they preserved material traces of the real. Indexicalization is no simple reflex of mechanical objectivity and is more varied and consequential than commonly imagined. This essay demonstrates this by returning to the sciences of face-to-face interaction, which crystallized in postwar America but drew inspiration from earlier research on talk therapy. Returning to efforts to record psychoanalysis sessions in the early 1930s “objectively,” it chronicles a shift in the technosemiotic mediation of knowledge. Whereas transcripts were originally “verbatim” records of literal content, researchers came to seek tacit, symptomological signs. And whereas mechanical recording was introduced to avoid an observer effect, it was later deemed necessary to preserve indexical traces for fine-grained analysis. This indexicalization had ontological as well as epistemological effects, and it was inspired not by mechanical objectivity but by the parallel capacities of the perceptive psychoanalyst and the receptive mechanical recorder, both virtuosic in registering the indexical richness of the communicative unconscious. The Forum for History of Human Science has issued a call for submissions for its Early Career Award and Article prize. Submissions for both are due May 15. Full submission details can be found on the FHHS website. More details follow below. FHHS/JHBS John C. Burnham Early Career Award (awarded annually)The Forum for History of Human Science (FHHS) and the Journal of the History of the Behavioral Science (JHBS) encourage researchers in their early careers to submit unpublished manuscripts for the annual John C. Burnham Early Career Award, named in honor of this prominent historian of the human sciences and past-editor of JHBS. The publisher provides the author of the paper an honorarium of US $500. (see details below). FHHS Article Prize (awarded in odd-numbered years)The Forum for History of Human Science awards a biennial prize (a nonmonetary honor) for the best article published recently on some aspect of the history of the human sciences. The article prize is awarded in odd-numbered years. The winner of the prize is announced at the annual History of Science Society meeting. A new piece in Qualitative Psychology may be of interest to AHP readers. Details below. 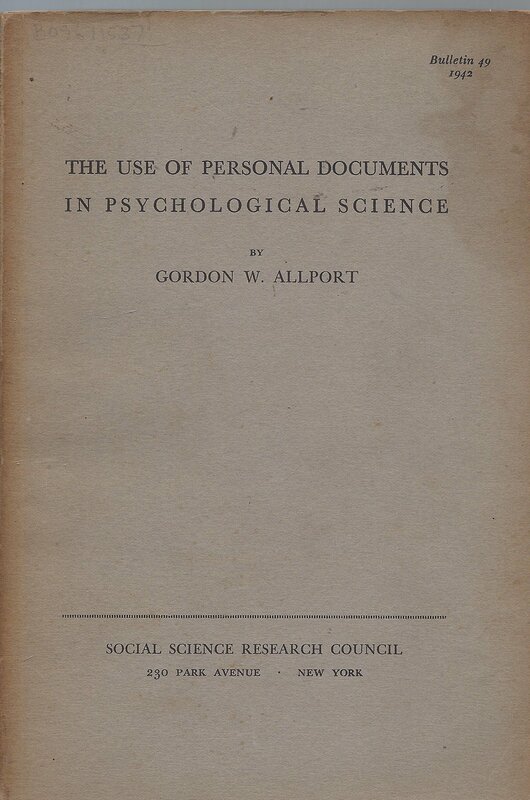 Published by the interdisciplinary Social Science Research Council (SSRC), Allport’s 1942 monograph on The Use of Personal Documents in Psychological Science (Allport, 1942) arose from the intersection of 2 sets of concerns: an extended effort by the SSRC during the 1920s and 1930s to chart the boundaries of valid research methodologies in the social sciences, and Allport’s insistence that psychology must account scientifically for individual persons in course of their actual lives. This historical review details a crisis that emerged in the late 1930s within SSRC-sponsored research concerning whether investigators could even use nonquantitative sources such as personal documents as scientific data. Allport’s own early scholarly agenda embraced German-influenced case study methods and the emerging field of personality psychology. This report outlines how, as Allport’s influence grew in the 1930s, he became a central, insistent, but relatively lonely voice rejecting psychological research methods that were exclusively experimental and quantitative. In this context, the Committee on Appraisal of Research of the SSRC accepted Allport’s self-nomination in early 1941 to assess how such data had been and could be used in psychology to achieve reliable and valid scientific results. This review traces how he went about the assignment and the uncertain evaluation he gave of his own work as it reached publication.